HAMPTON, Va. (February 6, 2019) -Rear Admiral (RADM) Michelle E. Dunwoody is an Assistant U.S. Surgeon General of the United States Public Health Service (USPHS). 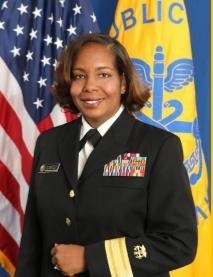 She provides national level policy, programmatic, administrative, and health leadership as the Chief Nurse Executive/Director of the Nursing Program for the Federal Bureau of Prisons (BOP). RADM Dunwoody leads the largest discipline of health services staff within the BOP with over 1,400 nurses and nurse practitioners across the nation’s federal correctional healthcare system. In this role, RADM Dunwoody created new nursing positions and implemented new nursing programs to support and elevate the nursing profession within the BOP. These innovations have significantly improved resource utilization of nursing services and inmate healthcare outcomes within the BOP.